All aboard the Night Train! 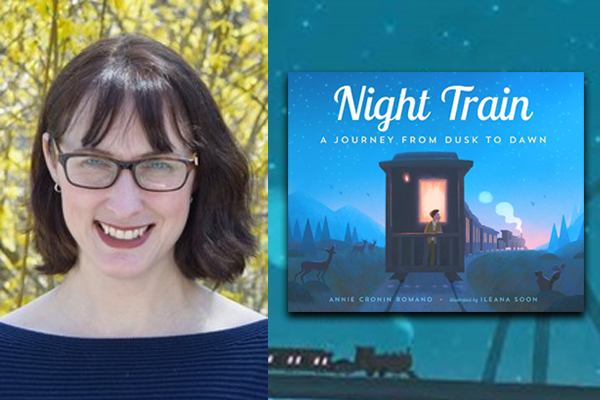 We’re traveling all night in a single afternoon with the author of the picture book, NIGHT TRAIN, Annie Cronin Romano! Celebrate the release of NIGHT TRAIN and settle in for a smooth ride as Annie talks about her rhythmic and cinematic book. With NIGHT TRAIN so full of warmth and wonder, this event will delight young readers. What do trains do while we sleep? This cinematic book takes readers along on a steam engine’s journey through the night, from a city to a small town. Varied landscapes as well as color shifts show the passage of time from dusk to night to dawn. The rhythmic text is perfect for bedtime reading, and train lovers young and old will appreciate the various railway details incorporated in the text and art. Annie Cronin Romano is a speech-language therapist and blogger. She has her teaching certification in high school English and a master’s in communication disorders. Her group blog “24 Carrot Writing” focuses on writing strategies and motivating writers. She lives in Massachusetts.